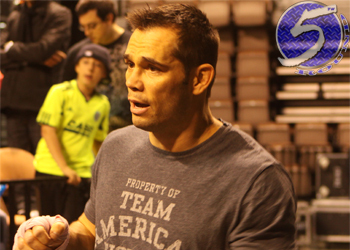 A 190-pound catchweight contest between Rich Franklin (Pictured) and Wanderlei Silva headlined the pay-per-view broadcast. After surviving a 2ndRound barrage, Franklin regained his composure to collect a unanimous decision victory. Rony “Jason” Mariano and Cezar Ferreira also won “The Ultimate Fighter: Brazil” featherweight and middleweight tournaments, respectively, in the the event. UFC president Dana White had to bolt back to the States and didn’t attend the presser. Octagon official Marshall Zelaznik ran the press conference in White’s absence. According to Zelaznik, 16,643 fans packed the arena. Zelaznik claims the UFC will eventually hit every major city in Brazil. A stadium show in Sao Paulo will likely happen in 2013. Much of the powwow was spoken in Portuguese and there was no English translation made available.